take the sacred darshan of him! 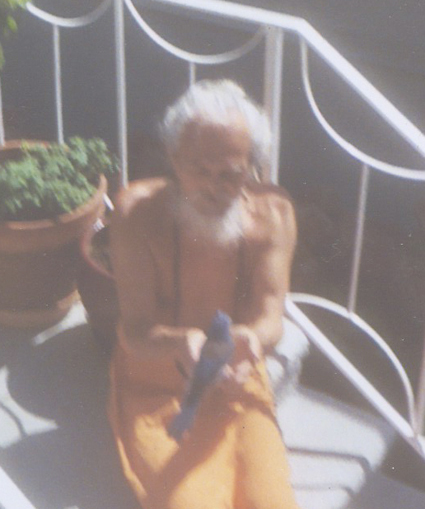 he is a tapas yogi, a sivayogi in meditative fire of silence and its joys for over 45 years. ari is the love formed body of yoga, that is sat-chit-ananda, the human form of the cosmic infinite. ari is the lotus above the mind that yoni like as inspiring joys of knowing that manifests each thought. ari is the possession of a crystal mind, pure and aligned in source. ari is the higher knowing eternally alight in human realities. ariven is the condensed sound and meaning of ‘i am’ that dwells in the three dimensions of the goddess- time, energy and space, united in the oneness of the infinite. in our namaste we offer our soul’s joy of each breath in recognition of the grand oneness to all the living. as spirit in our yogic experience of knowing inner joys lit each day in the physical, is the body and mind burnt constantly by the meditative fires of repetitive one thought of source and the thoughtless void of source. the fire within is the tapas,the meditative energies that creates the womb-like warmth of tummo. this inner fire is the warm blanket for the mind to summon and into this fire, to surrender of body consciousness to be the experience of being lit as the eternal lamp within. guided each breath in the knowing of purpose. abraham lincoln was ariven. mahatma gandhi, st francis of assisi…. socrates. “… a big cat god that purrrrrrs? 🙂 ” awakens us to our own mind when related to all others. the questions awakens us to the kaleidoscope of each of us in our perception of the divine when awake to celebrate the one in our multifaceted mind dissolved to be the experience. the experience of oneness within is awake to the infinite finite forms in the external. the soul recognizing all other souls as one. each of us in our beautiful colorful unique journeys, the divine angelic forms enjoying the human experience. the she and he within ourselves, both dissolved beyond gender in being ariven and shinning in the exclusive creative unique siddhis we each are graced to enable evolve. knowing purpose, the siddhis assist awakened as the collective thought of the awake. ariven we each are as receivers of grace! in our breath’s exhale, the awakener in presence. the awakened in the retention of breath. the awake, living in the tranquil breath. blessings and love to and from each of us, in the wholeness of being ariven!